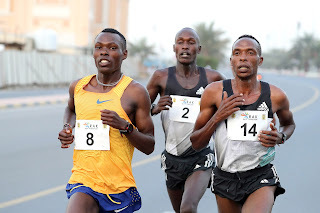 With the 12th edition of the super-fast RAK Half Marathon due to take place in the UAE on Friday 9th February, the confirmed men’s and *women’s elite fields clearly trump even the star-studded line-ups of one year ago. Reigning men’s champion Bedan Karoki is back to defend his title, but with fifteen men able to boast sub-60 minute bests – two more than last year - his task to win again, whether he runs as fast as his victorious 59:10 mark twelve months back or not, will be harder than ever. No less than twenty-nine men have now broken the hour on the sweeping loops of the RAK circuit, including the four under 60 minutes last year, each of whom set their personal best in the process, and three of them are back. Facing Karoki again, the astonishing Augustine Choge, able to boast the greatest range of world class times in history and who clocked 59:26 in third place in only his third half marathon, continues to seek experience before venturing to the full marathon, while Solomon Yego, fourth last year, dipped under the hour for the first time on a record-eligible course. Alongside them, twelve others have tasted “times in the 50’s”, their range varying from the hugely experienced Guye Adola of Ethiopia, with his 27:09 10,000m speed combining with his 2:03.46 marathon strength, to the raw talent of 20 year old Jorum Lumbasi Okombo of Kenya, who with his 58:48 in Copenhagen last September, was world No.2 in 2017. Others to watch include winner of RAK in 2014 and twice winner of the Boston Marathon Lelisa Desisa, the Ethiopian having won his last four half marathons, and compatriot debutante Jemal Yimer, who at 21 can already claim a fifth place in last summer’s world championship 10,000m as well as fourth spot in the IAAF World Cross Country Championships in March. With such a display of talent due to line up on the day of the Winter Olympic Opening Ceremony, those with an eye for road racing of the very highest quality can divert their attention to the live **broadcast of arguably the world’s consistently fastest half marathon of the last decade and more. *The women’s field, looking to improve on the then world record of Peres Jepchirchir from last year, is of astonishing strength, and has been described by one pundit as “of literally unprecedented quality and depth”. It will be announced on Monday 29th January. **The 12th RAK Half Marathon Women’s Elite race starts at 6.45am local time (2.45am UK) and the men 15 minutes later. The races are being covered live globally on Abu Dhabi Sports Channel 2 and can be found on the internet at https://video.tv.ae/channels/3078/ad-sport-2-hd or on the TVAE App on smart phones. Staying true to its reputation, the 12th edition of the RAK Half Marathon on Friday 9th February, will serve up a mouth-watering clash of established female superstar performers over the flat northern UAE circuit which has proven consistently through the last decade, the quickest half marathon course in the world. Headlining arguably the strongest field in history, will be world record holder Joyciline Jepkosgei, only third in RAK last year behind the 65:06 then world record of Peres Jepchirchir, with three-time RAK victor Mary Keitany returning at 36, herself second twelve months ago, and since last April, the women-only world record holder for the full marathon. While Jepchirchir sits out the race this year – she became a mother last October and astonishingly and perhaps uniquely, it has emerged she was one month pregnant when she broke the world record in RAK - four of the fastest seven women in history will line up for the 6.45am start, with another seven sub-68 minute performers alongside them. It was just 50 days after RAK 2017 and racing in Prague, that Jepkosgei improved the global mark, taking it to previously uncharted sub-65 minute territory, and then bettered that 64:52 clocking by one second in Valencia last October. For her part, Keitany runs for the fifth time and will follow a familiar and proven plan, as three times her RAK run has preceded one of her three titles in London. In 2011, she set a 65:50 world record in RAK, and then dipped under 2:20 for the full marathon for the first time in London, while in 2012 and last year, her RAK performance was the precursor to a top-spot in the English capital. Even last year, though beaten by Jepchirchir in RAK, the racing formula worked as ten weeks later she stormed to her historic 2:17.01 women-only mark ahead of RAK fifth placer Tirunesh Dibaba. Fancy Chemutai, from relative obscurity, burst in to the spotlight in 2017 with a trio of stunning half marathons, culminating in her staggering 65:36 second place last September in Valencia, behind Jepkosgei’s world record. 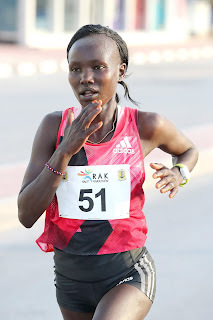 She is herself bullish of challenging the world mark in RAK and like Jepkosgei and Keitany, will arrive in the progressive Emirate with her own pacemaker. In contrast to the precocious and relatively inexperienced 23 year old Chemutai, Edith Chelimo is a seasoned campaigner, but rocked the road racing world at age 31 last October in Cardiff, when winning the city’s half marathon by almost five minutes in 65:53, itself over three minutes quicker than she’d managed in the previous seven years of racing. Others to benefit from the likely perfect conditions of RAK, include 2014 Half Marathon world champion Gladys Cherono, still in fine fettle at 34 after her Berlin Marathon win last September. Third in 2012 in RAK and runner-up in 2016 with her best of 66:07, her track-to-marathon pedigree still demands enormous respect. Another in form athlete is Eunice Chumba of Bahrain, who arrives after an impressive brace of half marathon wins in 2017, including her 66:11 winning time in Copenhagen last September. Mix in the likes of Joan Chelimo Melly, second in Copenhagen in 66:25, London-bound Brigid Kosgei, third in the Danish capital last September, along with Caroline Kipkirui, fresh from her best ever time of 66:48 for second in Houston on January 14th, and the legendary Vivian Cheruiyot, the 2016 Olympic 5,000m champion not even ranked in the RAK top ten, and you begin to realise how open this race might be. Many competing in the race have medium-term plans carefully mapped out. Keitany, Cherono, Kosgei and Cheruiyot are all targeting the London Marathon ten weeks after RAK, while Jepkosgei and Chemutai will be teammates in Kenya’s squad in Valencia at the 24th March IAAF World Half Marathon Championships. Of the London bound quartet, Keitany has attracted the most recent attention, as her stated plan on April 22nd is to challenge, with male pacers, Paula Radcliffe’s mixed-race marathon world record of 2:15.25, an arrangement that she will also be able to enjoy on the roads of RAK. The men’s field announced on Monday 22nd January, has been adjusted and strengthened. 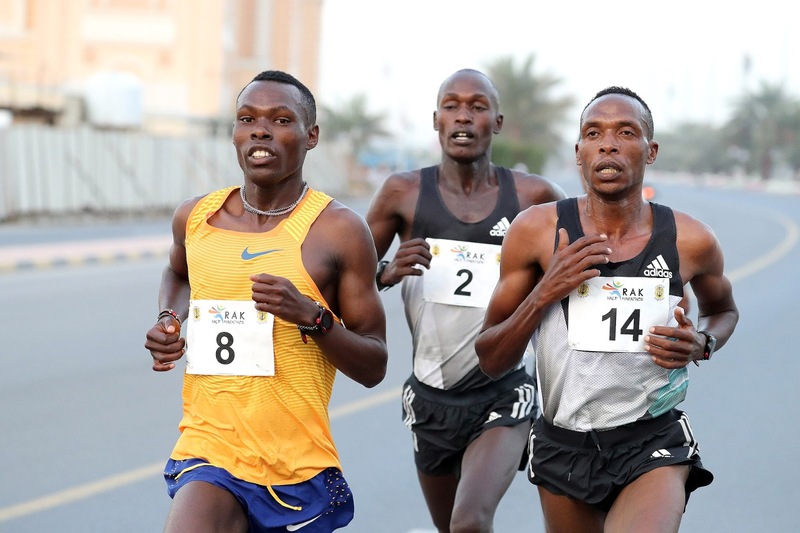 While last year’s RAK fourth placer Solomon Yego has pulled out with injury, both London-bound Stanley Biwott and Ghirmay Ghebreslassie have been added to the field. Biwott was runner-up in RAK in both 2013 and 2016, the earlier of those two runs producing his best of 58:56, making him the tenth fastest in history. His London record is similar with a pair of second places in 2014 & 2016; can he shake the “nearly man” tag in RAK this time round? Ghebreslassie is the 2015 IAAF World Marathon Champion and Rio Olympic fourth placer. Although he’s never broken 60 minutes, the combination of his aggressive racing style and the quick RAK circuit, could well make his UAE debut a sub-one hour experience.